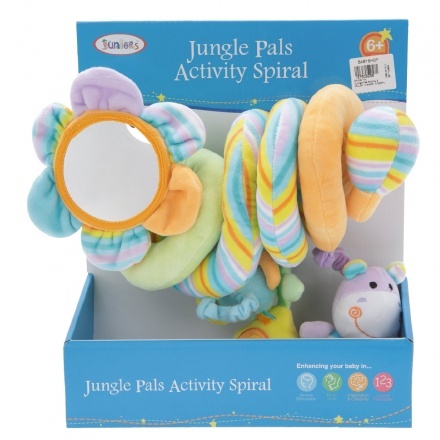 Juniors Jungle Pals Activity Spiral | It can be easily attached to the armrest of stroller. Get your little one to enjoy on-the go-playing with this activity spiral. Featuring a big flower at one end, it has hangings of your kid's jungle pals. With their soft plush feel and broad smiles, they are sure to help your kid enjoy his activities. Feature 1 : It can be easily attached to the armrest of stroller. Feature 3 : Made of plastic and cushion. Feature 2 : It can be rotated up to 36 degrees.